Heavy thunderstorms are also expected in Limpopo today. The South African Weather Service has issued a watch for severe thunderstorms and heavy downpours in Gauteng on Tuesday. The weather pattern will likely start from 2pm to 9pm tonight. 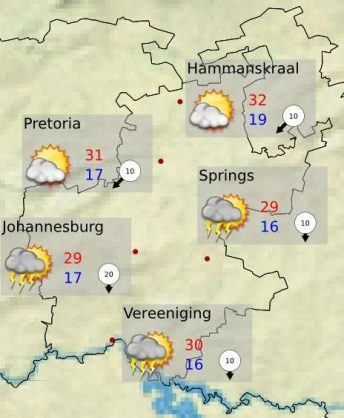 WATCH:05/03/2019 14h00 TO:05/03/2019 21h00 Severe Thunderstorms producing heavy downpours possible in Gauteng today. The southern parts of Elias Motsoeledi in Limpopo were also expected to experience severe thunderstorms from 3pm today, while the same pattern was expected over the central parts of Mpumalanga from 2pm today. The eastern parts of the North West would also experience severe thunderstorms from 2pm today, while the southern interior parts of Limpopo would experience the same weather pattern from 3pm today. In KwaZulu-Natal, severe thunderstorms were observed over parts of Zululand district, with a possibility of hail and strong damaging winds, moving towards uMkhanyakude district, and also over parts of Umkhanyakude, King Cetshwayo, and Mandeni in the evening today.